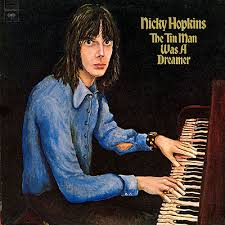 Sitting on a bench in London’s Hyde Park “on holiday” in Sept. 1994, I chanced upon a lengthy and admiring obituary of pianist Nicky Hopkins in The Guardian. Hopkins, one of rock’s great session players, had died at age 50, far away from the city where he had first rose to prominence in the Sixties, playing keyboards on classic recordings by the Stones, the Who, Jeff Beck, the Kinks and many others. Instead, he passed away in Nashville which seems oddly appropriate, giving his calling. Hopkins struggled with Crohn’s Disease throughout his life, making a career as a studio hired gun more agreeable than that of a touring musician. The Guardian obit talked about Hopkins’ uncanny instinct to play just what was needed on any number of great rock records—even the partial list in his Wikipedia entry is mighty impressive—he was an expert in both technique and feel. About halfway thru the article it was suggested that as a natural accompanist the result of his time taken in the spotlight was bound to be underwhelming. Still, “The Tin Man was a Dreamer” (his second and best known solo LP) is a good listen. I especially like the song below, with its sly wink to an occupational situation I’m sure he faced on more than one occasion. By the late Sixties, Hopkins had made a move to America’s West Coast, recording with Steve Miller, the Jefferson Airplane (with whom he played at Woodstock), Quicksilver Messenger Service and Jerry Garcia, among others. After Nick’s health problems caught up with him in 1994, Kinks frontman Ray Davies spoke appreciatively about the pianist’s great ability “to turn an ordinary track into a gem.” Of course, it was Davies who had, way back in ’66, wrote the tongue-in-cheek song “Session Man” partly with Hopkins in mind. But N.H. was a far cry from the song’s clock-punching player, as one listen to the tune’s distinctive harpsichord intro will indicate.